Lake Zegrze, or more precisely Zalew Zegrzynski, is an artificial reservoir on the lowest part of the rivers Narew and Bug, and situated some 20 km north of Warsaw’s northern borders. This is one of the most favourite weekend destinations for the inhabitants of the capital, owing its popularity to the numerous recreational activities taking place on its banks, and providing great conditions to practise water sports or simply to chill out on the shore. The lake is about 41 km long and some 3-4 wide, and is a preferred place for organizing business meeting and conferences. 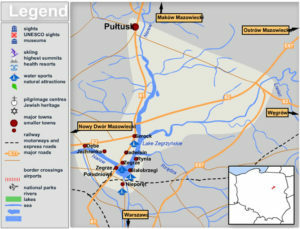 Most of the local towns, such as Serock, Bialobrzegi, Zegrze, Zegrze Poludniowe and Nieporet are within easy distance of Warsaw. Professional conference venues together with beautiful scenery make for really effective learning and team-building experiences. Access is easy from Warsaw by driving north through Bialoleka and Legionowo. 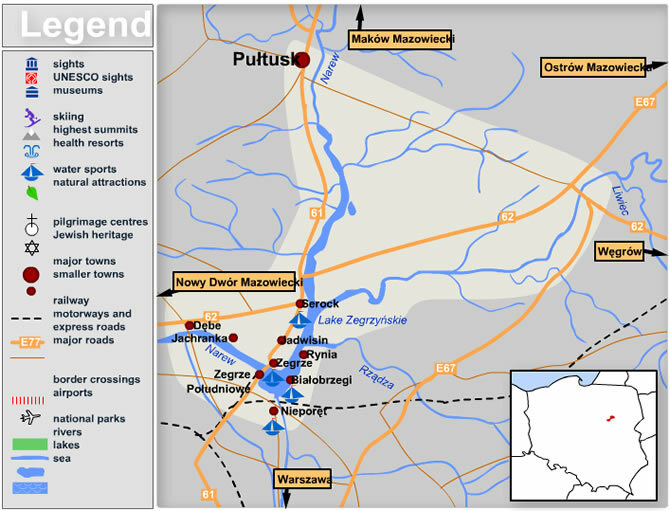 Continuing north along road 61 will take you to Pultusk and then on from there is the Nadbuzanski Landscape Park. Buses to Pultusk and towns around Lake Zegrze depart from Zachodni Station in warsaw. The very closeness to Warsaw makes this destination ideal for one-day or weekend trip, as well as for short business events.